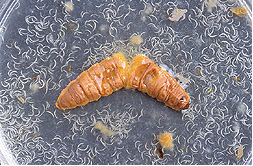 Beneficial nematodes should be used for soil-borne pests. Overall broadcasting is best. Spot treating helps if the budget dictates. In an organic program one treatment a year is usually enough. No, they do not hurt the beneficials. Apply per the label instructions for the control of fleas, ticks, grubworms, termites, fire ants and roaches. Beneficial nematodes are just one of the beneficial microbes that exist in healthy soil. That's why they seem to control more pests than they are supposed to. 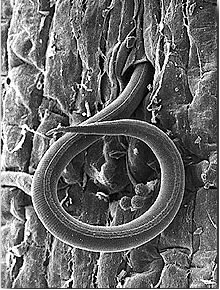 Root knot nematodes: Many nematodes are beneficial, but there are those that will attack ornamental trees, garden plants, and lawn grass. Controls include increasing the organic matter level in the soil, using organic fertilizers, and applying products that increase microbial activity. Cedar flakes applied to the soil surface will also help. You can also use a citrus oil drench or citrus peeling pulp tilled into the soil prior to planting or used around existing plants. Many stores that sell organic products say it's too cold to put out beneficial nematodes. That is bad information. If your area still has frozen weather, it is too early, but spring and fall are the very best times to apply them. Beneficial nematodes control thrips that are about to hit your roses, young ticks in the soil, fleas, grubworms, termites, fire ants, roaches and other pests that have at least one of their life cycles in the ground. 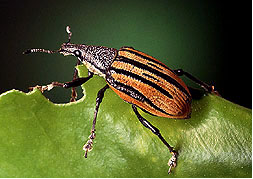 Beneficial nematodes should be used for all soil-borne pests. Overall broadcasting is best, but spot treating helps if the budget dictates. In an organic program one treatment a year is usually enough. No, they do not hurt the beneficials. Beneficial nematodes are just one of the beneficial microbes that exist in healthy soil. That's why they seem to control more pests than they are supposed to. Nematodes are tiny, un-segmented wormlike animals found in soil all over the world. Scientists think there are about half a million different species of nematodes. Some are crop pests, while others are crop protectors. Beneficial nematodes are valuable because they cause disease in destructive bug pests, but don't harm humans, other animals or the environment. Nematodes enter pest bugs while they are still alive, then they multiply inside the bugs (which eventually die) and finally burst out of the dead bodies. The number of nematodes inside a single bug (depending on the species) ranges from 10,000 to 500,000. Although you can barely see one young nematode with your naked eye, large groups of these tiny wigglers pouring out of the dead insects are easy to see. Then the nematodes wriggle off to find other insects to "invade," starting the whole cycle all over again. 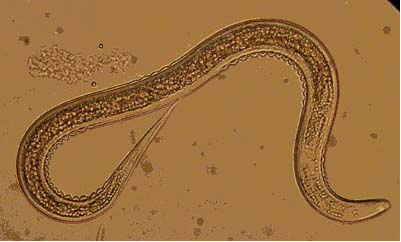 Nematodes are an important natural replacement for toxic chemical insecticides. They protect crops such as citrus, vegetables, pecans, cranberries, mushrooms and ornamental crops by killing most pests that live in the soil. Nematodes kill by making a “home” for bacteria that lives inside them. In return, the bacteria provide nutrients to the nematodes. Once a nematode gets inside a pest bug, the bacteria leave it. Working together, nematodes and bacteria are able to kill insect hosts after about 48 hours. Then they feed off the insect and multiply inside it. Note: Photos from ARS: Solving agricultural problems with science. ARS' Sci4Kids: Bridging the gap between science, agriculture, and you.